"The Little Things I Love"
(1966) "Ruby, Don't Take Your Love to Town"
"Ruby, Don't Take Your Love to Town" is a song written by Mel Tillis about a paralyzed veteran of a "crazy Asian war" (given the time of its release, widely assumed—but never explicitly stated—to be the Vietnam War) who either lies helplessly in bed or sits helplessly in his wheelchair as his wife "paints [herself] up" to go out for the evening without him; he believes she is going in search of a lover, and as he hears the door slam behind her, he pleads for her to reconsider. The song was made famous by Kenny Rogers and The First Edition in 1969. "Ruby" was originally recorded in 1967 by Johnny Darrell, who scored a number nine country hit with it that year. "Mel Tillis wrote this song. He based the song on a couple who lived near his family in Florida. In real life, the man was wounded in Germany in World War II and sent to recuperate in England. There he married a nurse who took care of him at the hospital. The two of them moved to Florida shortly afterward, but he had periodic return trips to the hospital as problems with his wounds kept flaring up. His wife saw another man as the veteran lay in the hospital. Tillis changed the war in the song to the Korean War, and left out the life ending: the man killed her in a murder-suicide. In the song, the man says he would kill her if he could move to get his gun." "Once Again, She's All Alone"
(1969) "Ruby, Don't Take Your Love to Town"
In 1969, after the success Kenny Rogers and the First Edition had enjoyed with the hits "Just Dropped In (To See What Condition My Condition Was In)" and "But You Know I Love You," Rogers wanted to take his group more into a country music direction. They recorded their version of the song, with Rogers singing the lead, in a single take. The record was a major hit for them. It made #1 in the UK on the New Musical Express (#2 on the BBC chart) staying in the top 20 for 15 weeks and selling over a million copies by the end of 1970. In the United States it reached number six on the Billboard Hot 100 and number 39 on the country chart. In 1977, now performing solo after the First Edition disbanded in early 1976, Rogers made re-recordings of this, and a number of other First Edition hits, for his 1977 greatest hits package Ten Years Of Gold. (It was later issued in the British Isles as The Kenny Rogers Singles Album.) Ten Years Of Gold topped the US country charts under that title, and as The Kenny Rogers Singles Album, it was just as successful in the United Kingdom. The song has been recorded many times by various artists. The Statler Brothers had an early cover in 1967 on their album, Big Country Hits. Other artists who have recorded versions include Bobby Bare, Dale Hawkins, Waylon Jennings, Roger Miller, Cake, The Killers and Leonard Nimoy. Several foreign-language versions have been recorded: Greek singer Nana Mouskouri recorded a French version entitled "Ruby, garde ton cœur ici" for her 1970 album Dans le soleil et dans le vent; Gerhard Wendland recorded a German version "Ruby, schau einmal über'n Zaun" in 1970; Pavel Bobek, Czech country singer, recorded "Oh Ruby, nechtěj mi lásku brát" in 1981; Gary Holton and Casino Steel's English-language version was a number one hit in Norway at the beginning of 1982. French singer Eddy Mitchell recorded a French version entitled "Ruby tu reviens au pays" for his 1974 album Rocking in Nashville. An answer song to "Ruby," entitled "Billy, I've Got to Go to Town," was released in 1969 by Geraldine Stevens, who had previously recorded successfully under the name Dodie Stevens. Sung to the same melody with an arrangement quite similar to the First Edition version, "Billy" peaked at #117 pop, #57 country. In Stevens's song, Ruby affirms her love for her disabled husband, who is named "Billy" in her song whereas in "Ruby," he is not named, and she pleads in turn for her man to have faith in her fidelity and her commitment to him, even in his paralyzed condition. In 1972, Bobby Womack released the album Understanding, which included the song "Ruby Dean." The lyrics and melody are similar to "Ruby, Don't Take Your Love to Town" but the story is told from the perspective of Ruby's son. The son urges his mother to respect his father and to stop seeing other men. In the original song, no children between the couple are ever mentioned. A music video consisting solely of a camera panning back and forth in a bedroom was shown at the end of a Huntley-Brinkley Report during 1969. Chet Huntley set up the video by linking it to the controversial Vietnam War and the sacrifices by U.S. servicemen and their families. Chet Huntley and David Brinkley paused after the video and then signed off in their usual fashion. 1 2 Whitburn, Joel (2008). Hot Country Songs 1944 to 2008. Record Research, Inc. p. 115. ISBN 0-89820-177-2. ↑ "Johnny Darrell - Ruby, Don't Take Your Love To Town / The Little Things I Love - United Artists - USA - UA 50126". 45cat. Retrieved 2015-11-23. ↑ Kenny Rogers UK Charts history, The Official Charts. Retrieved September 10, 2011. 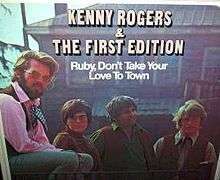 ↑ "Kenny Rogers And The First Edition* - Ruby, Don't Take Your Love To Town (Vinyl)". Discogs.com. Retrieved 2015-11-23. ↑ Lietenant Colonel Marc D. Felman. "School of Advanced Airpower Studies : The Military/Media Clash and the New Principle of War : Media Spin" (PDF). Au.af.mil. Retrieved 2015-11-23. ↑ Archived July 25, 2013, at the Wayback Machine.